Napoleon Sarony, Portrait of Oscar Wilde, 1882. Albumen Silver Print. Metropolitan Museum of Art. 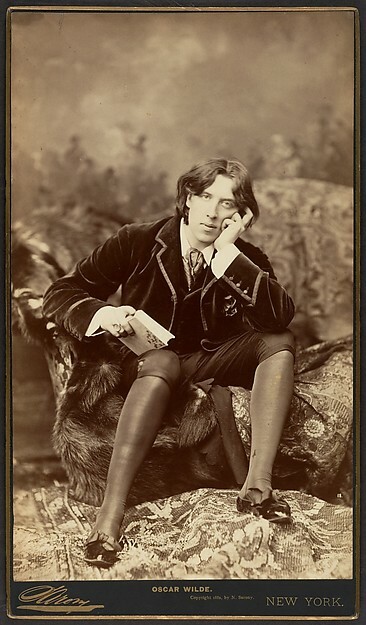 While Wilde’s complaint was artistic in nature–one imagines a horrible floral wallpaper like the kind Henry Cole included in his “Chamber of Horrors” cracking and peeling before his very eyes–his desire to connect wallpaper and mortality was not without merit. 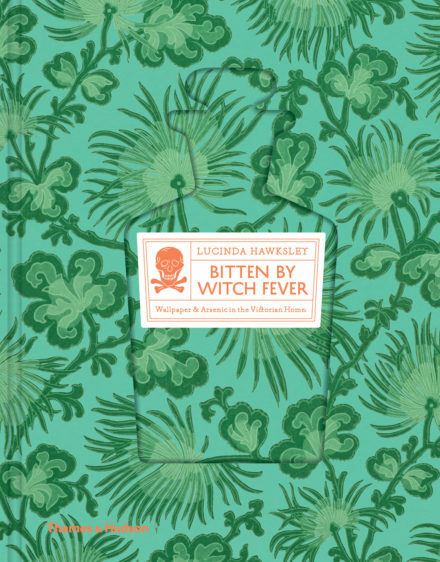 Lucinda Hawksley’s recent book Bitten by Witch Fever: Wallpaper and Arsenic in the Victorian Home (Thames and Hudson, 2016) details the fatal role played by arsenic in producing the bright colors of Victorian wallpaper. Unlike some of the wallpapers it chronicles, the book itself is a beautifully designed object with an innovative structure: it features color facsimiles of 275 wallpapers from the National Archives. These samples tested positive for arsenic in recent studies. (the process is documented in a fascinating blog post by heritage scientist Dr. Helen Wilson.) 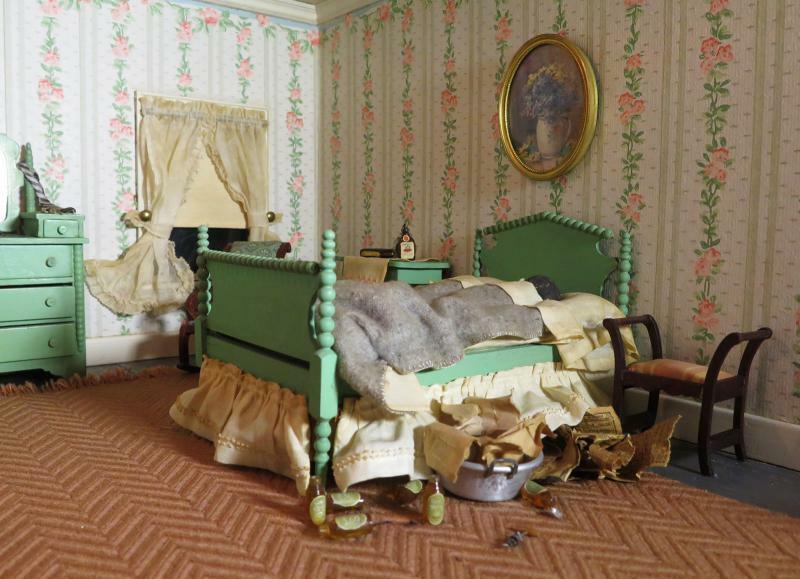 How did this fatal substance wind up in wallpaper? In 1771, the Swedish chemist Carl Wilhelm Scheele discovered that he could produce a green pigment from copper arsenite. Later experiments by the German industrialist Wilhelm Sattler combined arsenic and verdigris (also obtained from copper) to create a deep and opaque shade of green known as “emerald green,” “Paris green,” or “Schweinfurt green” (Sattler’s dye company was based in Schweinfurt, Germany). This new green could be used alone or to enhance yellows and blues, and it soon appeared in paintings, clothing, candy, and wallpaper. 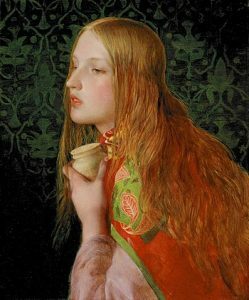 Frederick Augustus Sandys, Mary Magdalene, ca. 1858–60, Oil on panel, Delaware Art Museum, Wilmington. 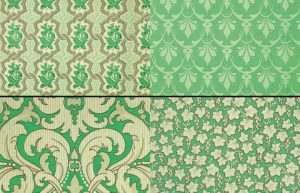 As Hawksley discusses, the vibrancy and color fast-ness of this new green made it a boom for the burgeoning wallpaper manufacturing industry. As she details, “by the 1850s, it was possible to print complex patterns using up to eight different colours at the same time. 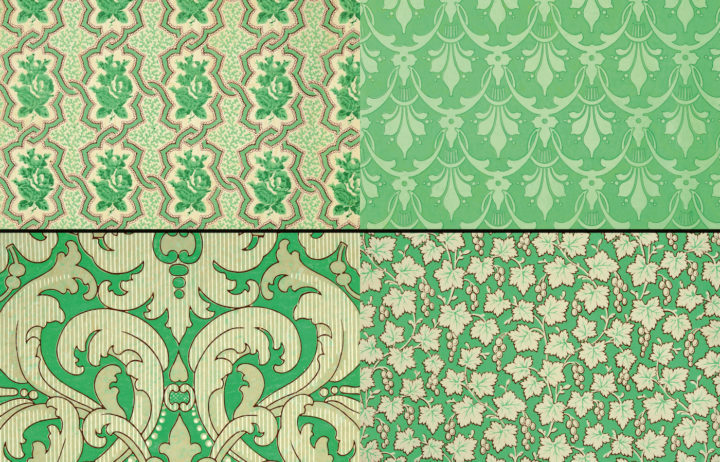 In Britain, production rose by more than 2,615 percent, from 1,222,753 rolls in 1834 to 32,000,000 rolls by 1874.” She notes that the new green fit perfectly with the taste in the 1840s for vibrant patterned wallpaper like the kind seen in the background of Frederick Sandys’s Mary Magdalene (c. 1859). Although reports suggested that the wallpaper could be a health hazard as early as 1839, and reports of wallpaper poisoning appeared throughout the 1850s, arsenic was not banned until 1883, with the Factory Workshop Act, later revised in 1895. At least one wallpaper designer thought that danger was exaggerated, when doctors advised their patients to tear down their wallpaper: “As to the arsenic scare a greater folly it is hardly possible to imagine: the doctors were bitten as people were bitten by the witch fever.” His name was William Morris. “The Earthly Paradox,” caricature of Morris by John Phillip Stafford from ‘Funny Folks’ Oct. 10, 1885. (1851 – 1899). Morris’s appearance in Hawksley’s book is not surprising given the prominent role he played in design and wallpaper manufacture from the 1860s onward. Yet Morris is not the hero of this tale, campaigning against the considerable suffering of those exposed to arsenic. Instead, he benefited financially from his father’s investment in the Devon Great Consols, a mining venture and producer of arsenic in Devon. 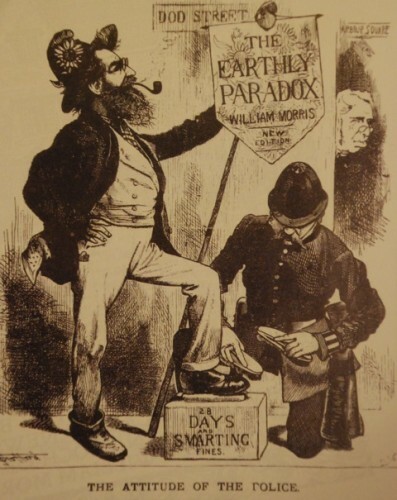 Morris would serve as one of the Directors from 1871-5 before selling his shares in 1877 as he began to explore a socialist analysis of society and economics. Retrospectively, many consider his response is surprising given his socialist politics, his concern for working conditions, as well as his interest in reviving natural dyes. Bitten by Witch Fever has generated sensational headlines for the revelation that “poison was everywhere in the Victorian home.” But knowledge of Morris’s use of and attitude toward arsenic has been a topic for discussion since at least 2003 when a study by Professor Andy Meharg analyzed a sample of Morris’s “Trellis” wallpaper for arsenic. As Meharg concludes, “[Morris] seems to have had a blasé attitude to health concerns. However, we cannot be too harsh on him. ­ He was a product of his time.” Whatever one may think about Morris’s attitude towards the medical condemnation of arsenic, Hawksley points out that his indifference to the welfare of the miners, including children, is a “great unanswered question.” It is worth noting that literary scholar Elizabeth Miller has provided another perspective on this issue in her article “William Morris, Extraction Capitalism, and the Aesthetics of Surface.” For her, it was Morris’s encounter with the extraction capitalism of mining that led him to think about surface (sunshine, air) rather than depth, and this emphasis on “exteriority” also plays a role in his attitude toward the design of wallpaper patterns. Although firms were later able to market “arsenic free” wallpaper, the association of brightly printed wallpaper and domestic danger lingered. As Hawksley suggests, maybe arsenic is to blame for the maddening effecting of a vivid yellow wallpaper on the narrator of Charlotte Perkins Gilman’s novella The Yellow Wallpaper (1895). 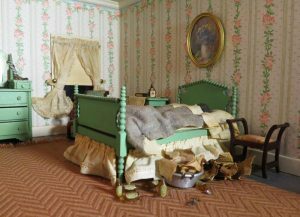 More recently, the conjunction of wallpaper and death had us at Home Subjects looking again at the exhibition Murder is Her Hobby: Frances Glessner Less and the Nutshell Studies of Unexplained Death at the Smithsonian’s Renwick Gallery (the exhibition is open until January 28, 2018). Lee produced “dollhouse-sized dioramas of true crime” to train police investigators to observe a crime scene to uncover and understand evidence. Lee, who was both an artist and an investigator, pays careful attention to the domestic interior in the imagined crime scenes. The Smithsonian has organized the exhibition to appeal to the detective within: “As the Nutshells are still active training tools, the solutions to each remain secret. However, the crime scene ‘reports’ (written by Lee to accompany each case) given to forensic trainees are presented alongside each diorama to encourage visitors to approach the Nutshells the way an investigator would.” Yet more than one visitor was overheard remarking upon the interior decoration of these dioramas, and Home Subjects couldn’t help but notice a very sinister looking wallpaper in the “Striped Bedroom” with a pattern of pink roses and green foliage. Maybe the wallpaper did it?